By Scott Gilfoid: Trainer Peter Fury says that his fighter Hughie Fury (16-0, 8 KOs) will agree to face unbeaten WBC heavyweight champion Deontay Wilder (34-0 33 KOs) if he’ll let young Hughie get a full 8 weeks of training. Apparently, the 7 ½ weeks that Hughie would be getting if he agreed to the fight isn’t good enough. It would be short three days of 8 weeks. Peter wants Hughie to have the full 8 weeks, not just 7 ½ weeks. Of course, it doesn’t take a blind man to see that Peter and Hughie just don’t fancy the job of going out there and trying to beat what arguably is the hardest puncher in the heavyweight division right now in the 6’7” Wilder. I smell fear from Peter Fury. I don’t think he wants to let his 20-year-old son Hughie go out there and face what could be a furious beating at the hands of the hard hitting Wilder. It’s just so bad he excuses though from Peter. First it was Wilder asking Hughie to take the fight on only 4 weeks’ notice, but that excuse obviously didn’t work with the fight being 7 ½ weeks away on September 26th. I guess someone pointed out to Peter that Wilder’s next fight is on September 26th, not August 31st. But instead of agreeing to let Hughie take the fight, Peter is now saying that he wants a full 8 weeks of training for Hughie. It’s such a flimsy excuse for not letting Hughie fight, isn’t it? 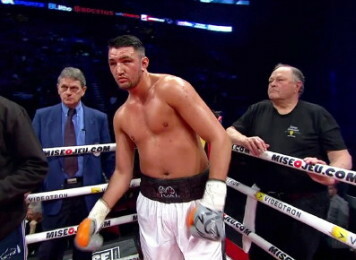 I mean, if a young 20-year-old can’t get in shape for a world title fight in 7 ½ weeks with just 3 days shy of a full 8 weeks, then I don’t see what difference it would make if Hughie were given 8 weeks. Heck, they could give Hughie 11 weeks to train like it was Marine Corp boot camp, and I still don’t see him being ready to take the fight. I’d hate to think of what the excuses would be from Peter under those circumstances. ’11 weeks isn’t enough. Give up 12 weeks, and we’re 1000%.’ Oh, it’s just so, so sad. How many weeks does a young pup like Hughie need to get ready for a fight” since when is a 20-year-old that out of shape to where he needs 8 weeks of training rather than 7 ½? Hughie has beaten George Arias and Andriy Rudenko in his last two fights. He’s changed his fighting style from top to bottom in becoming a mover rather than a puncher, and he seems to have adapted well to the change. It’s obvious that this is a change that will be permanent for Hughie. He doesn’t have the punching power to stand in the pocket and slug with the best heavyweights in the division, so he’ll be using the Paulie Malignaggi peck and run style to try and get over. It’s a style that will work against the B and C level heavyweights, but when he goes up against a heavyweight that cuts off the ring and puts pressure on him, he’ll be just like Malignaggi was in getting battered and beaten until the referee does him a favor and stops the fight. I think this will likely be the first and last time that Hughie is given an offer for a world title fight, which is kind of sad that his trainer/father Peter is turning the fight down because he’s only getting 7 1/2 weeks of training instead of 8 weeks. I have a feeling that they’re going to be kicking themselves in the backside years from now when Hughie starts to age, get beaten and reduced to journeyman status at an early age. I think he’ll be regretting that he and his father didn’t accept the fight and get some life changing money. With the payday that Hughie could get for this fight, he’d be able to buy a nice flat in London and at least have that going for him when the bottom drops out in his career. It’s too bad though because I don’t see Hughie ever getting another title shot, because he’s not going to be given a voluntary shot. He’ll have to work his way to a No.1 spot with one of the sanctioning bodies, and the only way you can do that is by beating someone like Alexander Povetkin. Can you picture Hughie beating a talent like Povetkin? I can’t even picture seeing the two of them in the same ring. It would be such a mismatch.